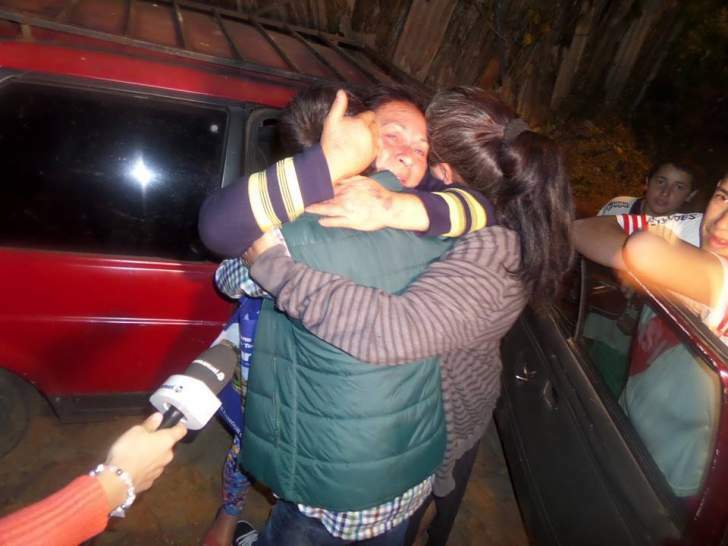 Breaking News – TB Joshua transforms Paraguayan transvestite! Famous Nigerian Prophet T.B. Joshua recently travelled to the nation of Paraguay where he received the country’s highest honour and held a Miracle Crusade. Antonio was just seven years old when he first realised a growing affection for the males in his classroom. He tried to shelve the nauseating urge by playing sports and engaging in predominantly ‘masculine’ activities. But the young boy soon began stealing his sister’s underwear and wearing it at whim, buoyed by a strange form of guilty pleasure. His first full-blown homosexual encounter came at the tender age of 11. It was downhill from there. “When I was 18, I went onto the streets,” the Paraguayan explained. It was the beginning of ten years in which Antonio would change his name, identity and – almost – his gender. Dressed in seductively tight female clothing, pumped with feminine hormones to remove body hair and develop breasts, cars with male occupants would stop to pick him up every night. Drug-fuelled, drunken orgies became the norm, to the shady extent that Antonio could not even remember who he had been with the previous night or what he had done. “Something within me kept telling me I was a lady,” he explained, adding that he went by the female pseudonym ‘Dexis’ when attracting suitors online. And Antonio was not just prostituting in the physical alone. “Different men would call me by my female name in my dream and sleep with me,” he revealed. This was a ‘normal’ life for Antonio, one which he saw nothing wrong with. He was a notorious transvestite and drug addict, known not just in his neighbourhood but throughout the country. Thus, when his sister invited him to attend a Christian crusade with Prophet T.B. Joshua, he not only refused but mocked her for even nursing such a notion. “I thought everything about that crusade was fake and false,” he admitted. On Friday 11th August 2017, Antonio lazily switched on the live broadcast of the crusade on YouTube to see the ‘freak-show’ his sister had strangely chosen to attend. Unbeknown to him, she was feverishly clutching a picture of her brother, praying for the Spirit of God to touch him right in their house that night. “I was watching just to make jest of the whole programme,” Antonio explained. He snidely laughed as people fell at the prayer of the ‘prophet’. What nonsense! But then, something inexplicable began to happen. Something supernatural. Something Antonio never imagined or bargained for. “As Pastor Joshua began to pray, something touched my inner being,” he recounted. In one Divine instant, everything changed for Antonio. Literally everything! It was if a dark veil had been lifted from his eyes. “I began looking at myself and asking why I was wearing female clothes,” he recalled. “I lost affection for men and stopped taking the female hormones. Now, I want to be a man again!” Antonio spontaneously threw his phone away – filled with all the contacts and connections to his past life – and took a hair cut to remove the long flowing blonde locks he was once known for. “After the deliverance, I actually slept in peace for the first time in my life,” he tearfully testified. 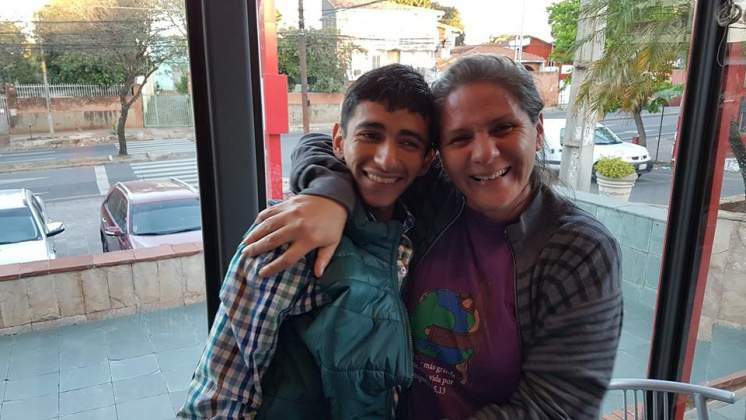 Moved at seeing the condition of Antonio, who didn’t even own a single item of male clothing, the Emmanuel TV Team in Paraguay sprang to action, taking him to a local shopping mall. 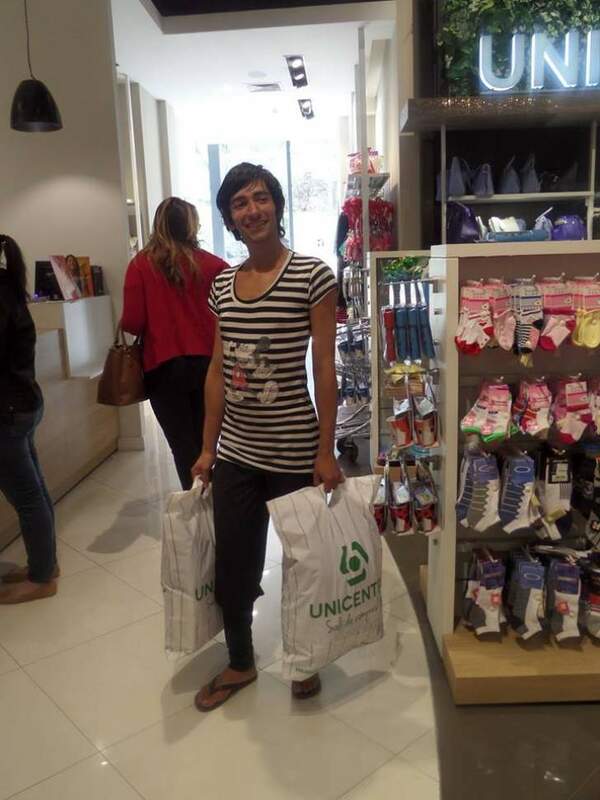 $500 worth of male clothing was purchased and freely given to the young man. Subsequently, Prophet T.B. Joshua sent the team to Antonio’s house. The reaction of neighbours and family members when the young man exited the vehicle next to his home was priceless. No words can do justice to depict that emotional moment. This entry was posted in Featured Articles on August 22, 2017 by TB Joshua Fans UK Blog. I bless and glorify our Lord and Savior Jesus Christ for what you have done in the life of Antonio Caceres when Prophet T. B. Joshua was ministering a Mass Prayer through YouTube’s Emmanuel TV channel. For the salvation of his soul. Born a man Antonio Caceres lived his entire adult life as a woman. His clothing was female. His mannerisms were female. His style of speech was female. 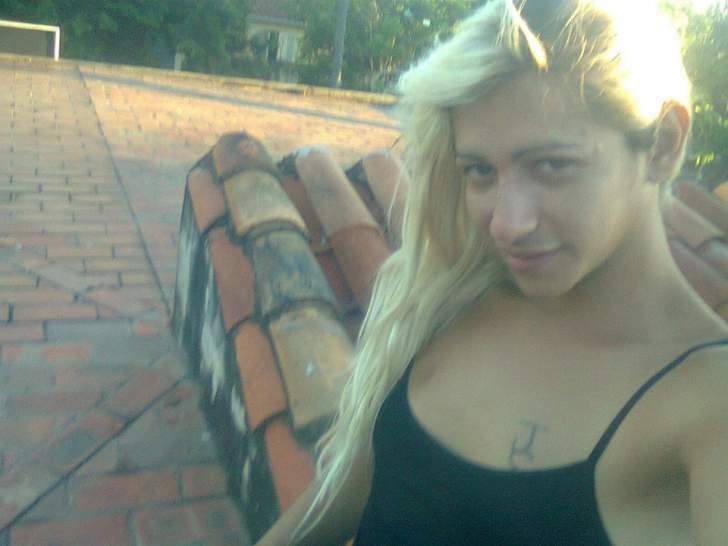 The only connection to males he had were the clients who paid for his nocturnal services as a professional prostitute on the streets of Lambare, Paraguay. Here is the incredible story, told in his own words of his transformation back to the original position in which God created him. Antonio was just seven years old when he first realised a growing affection for the males in his classroom. He tried to shelve the nauseating urge by playing sports and engaging in predominantly masculine activities. But the young boy soon began stealing his sister’s underwear and wearing it at whim, buoyed by a strange form of guilty pleasure. His first full-blown homosexual encounter came at the tender age of 11. It was downhill from there. When I was 18, I went onto the streets, the Paraguayan explained. It was the beginning of ten years in which Antonio would change his name, identity and almost – his gender. Dressed in seductively tight female clothing pumped with feminine hormones to remove body hair and develop breasts, cars with male occupants would stop to pick him up every night. Drug-fuelled, drunken orgies became the norm. to the shady extent that Antonio could not even remember who he had been with the previous night or what he had done. Thus when his sister invited him to attend a Christian crusade with Prophet T.B. Joshua, he not only refused but mocked her for even nursing such a notion. “I thought everything about that crusade was fake and false,” he admitted. On Friday 11th August 2017, Antonio lazily switched on the live broadcast of the crusade on YouTube to see the freak-show his sister had strangely chosen to attend. Unbeknown to him, she was feverishly clutching a picture of her brother, praying for the Spirit of God to touch him right in their house that night. “I was watching just to make jest of the whole programme.” Antonio explained. He snidely laughed as people fell at the prayer of the prophet. What nonsense! But then, something inexplicable began to happen. Something supernatural. Something Antonio never imagined or bargained for. “As Pastor Joshua began to pray something touched my inner being,” he recounted. In one Divine instant everything changed for Antomio. Literally everything! It was if a dark veil had been lifted from his eys. ” i began looking at myself and asking why I was wearing female clothes” he recalled. I lost affection for men and stopped taking the female hormones. Now I want to be a man again” Antonio spontaneously threw his phone away – filled with all the contacts and connections to his past life – and took a hair cut to remove the long flowing blonde locks he was once known for. “After the deliverance, I actually slept in peace for the first time in my life.” he tearfully testified. 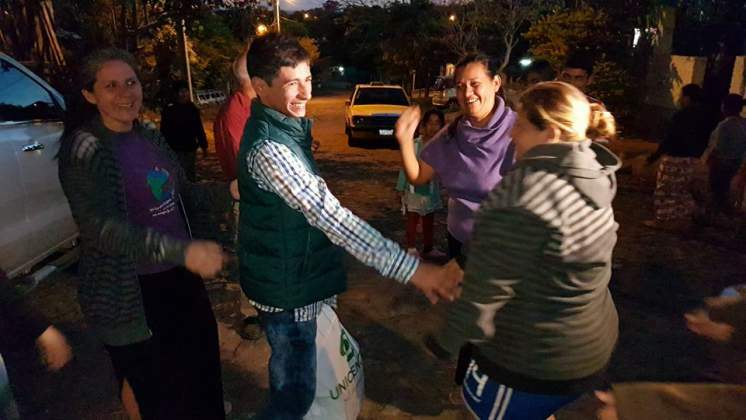 Moved at seeing the condition of Antonio, who didn’t even own a single item of make clothing, the Emmanuel TV Team in Paraguay sprang in action, taking him to a local shopping mall. $500 worth of male clothing was purchased and freely given to the young men. Subsequently, Prophet T. B. Joshua sent a team to Antonios’s house. The reaction of neighbours and family members when the young men exited the vehicle next to his home was priceless. No words can do justice to depict that emotional moment. Tears flowed as witnesses came forward to explain that all their lives, they had known Antonio as a woman. “God has restored back to us what the devil had stolen.” his sister declared. 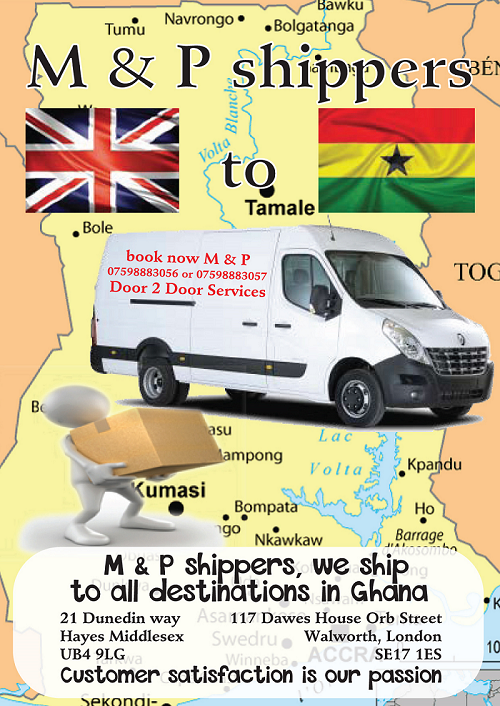 ” If God has delivered me, there is no one He cannot deliver.” Antonio advised. “If you are living the lifestyle I once lived, you may think it’s normal but it is not you need deliverance. God hates sin not sinners. When I say. Do not judge so that you will not be judged. I mean we should hate sin, not the sinner because sinners can change. If you have killed a sinner by judging him, there will be no opportunity for change. Sinners can be delivered. We should hate the act, not the people our battle is not against flesh and blood but against the spirit beings that cause all these acts. The Bible is my standard. If my parents were one. I would not have been given birth to. Those that are asking this question – if your parents were one, you would not have been given birth to. You that a reading me – if your parents were one, you would not be reading this today. God bless the reader and the hearer. Ihechukwu Njoku is a freelance Nigerian journalist. I am encouraging Antonio Caceres to read the Holy Bible and pray everyday so that you grow. Love the Living Word of God and obey His Living Word and do what it says so that the deliverance which you have received may last for ever. Commit to the Lord Almighty whatever you do and your plans will succeed May the grace of the Lord and the fellowship of the Holy Spirit and the love of Christ be with you and your family now and forever. In the name of Jesus Christ.